Alina Zavatsky is a marathon runner, fitness enthusiast, and a vegan recipe developer. She created her blog, Vegan Runner Eats, to show that compassionate living can go hand in hand with being healthy and active. She also believes that a good workout doesn’t have to belong to the gym, and challenges herself to exercise outside as much as possible. You can follow Alina on Facebook and Twitter. The idea of being vegan always resonated with me. I’ve always loved animals, and for the most part of my life, it seemed illogical to love them and eat them at the same time, but I was just doing what everyone else around me was doing. I’d never met other vegans until I went vegan myself, so for a while I assumed that being vegan is extremely hard and unhealthy, especially for athletic people. In 2012-2013, I started educating myself about veganism and realized that my previous views on vegan nutrition were a misconception, so finally making a switch seemed logical. Now I can look at animals in peace, because I don’t eat them anymore. I went vegan in May of 2013 and never looked back. In November 2013, I ran a marathon as a newly vegan runner, and documented my training and racing on my blog. I am very impressed with the improvement in my athletic endurance. I can keep going even when it seems like there’s nothing left, and I recover from workouts much faster. Plus, I enjoy having a lot of energy all day long, without midday crashes. Being vegan means exercising compassion towards all living beings – animals, other people, and ourselves. As much as we want to be kind to animals by not exploiting or killing them, we should remember to be kind to each other by leading by example, and not shaming. Kindness always works better than harassment. I use a combination of running and high-intensity interval training (HIIT). I try to incorporate weights whenever I can to build muscle. Ideally, 5 days a week for 30-60 min. 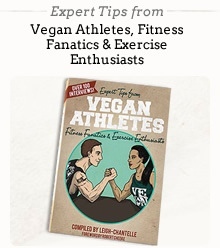 I don’t at the moment, but it’s something that seems very appealing to me, so I may eventually decide to study and become a vegan fitness trainer. Running is my primary sport, but I also do a little bit of cycling and swimming, as well as weight training and calisthenics. I’ve recently tried Pilates and liked it a lot. Unfortunately, vegans are often considered to be preachy and judgmental. I try to show with my own example that it doesn’t have to be that way. We can convince way more people to try out this compassionate lifestyle with our own kindness and support. Also, there’s a misconception that a plant-based diet is deficient in a lot of nutrients - especially protein - so this is another thing that I try to disprove by my own example. My improved endurance - great for long-distance running! - and the ability to recover quickly. Consuming plenty of calories to support my energy needs. Whenever I train a lot, especially for long-distance races, I tend to get hungry quickly, so I have to make sure to always have healthy snacks on hand. Generally, people are supportive. Every now and then, I hear concerns about my protein and nutrient intake, but I try to explain my position in a friendly manner, and that usually works well. There was a lot of skepticism at first because my family and friends didn’t know a lot about veganism, but once I showed them that it was working out great for me, they accepted it. At first, my husband was eating my vegan meals at home but ordered meat whenever we went out, but eventually he joined me after a couple months. I’m very proud of his progress. The protein question must be the most popular one I hear. I try to explain that we don’t need as much protein as we’ve been told by the meat and dairy industry. If someone says that they are afraid of becoming protein-deficient on a vegan diet, I tell them that I run marathons and do a lot of weight training as a vegan, and I have yet to experience any trouble from the lack of protein. It’s great to realize that not a single living being had to be killed or tortured in order for me to enjoy delicious and healthy meals every day. The longer I’ve been following this lifestyle, the more logical it seems to me. Breakfast – Overnight oats with nuts, dried fruit, ground flaxseed and sometimes, cocoa powder. Lunch – A lot of veggie wraps, baked potatoes topped with beans and salsa, or green salads. Dinner – Bean and lentil stews, soups, stir-fries, casseroles like my vegan moussaka, etc. I try out new recipes all the time. Snacks (healthy & not-so healthy) – Hummus with veggies, homemade granola bars, all kinds of fruit. Not-so-healthy: I bake a lot, so here we go. Protein – Beans, tofu, tempeh, seitan. Iron – Beans, leafy greens, blackstrap molasses. Fruit, and starchy foods like potatoes and rice. Gaining muscle – Eat protein with every meal, lift heavier weights, and do cardio in moderation. Losing weight – Eat a lot of fresh fruit and vegetables, eliminate all oils and vegan junk foods, incorporate longer cardio sessions into your workouts. Maintaining weight – Exercise regularly, and avoid long breaks between meals. Improving metabolism – Eat more veggies and minimally processed foods, combine cardio and weight training. Toning up – Don’t be afraid of lifting heavier weights at the gym. I write about the benefits of a plant-based diet and vegan lifestyle on my blog. I try to include actionable tips anyone can follow to become compassionate, healthy and active. I focus on positive aspects of this lifestyle on my blog’s Facebook page. As for the people around me, I try to be supportive and lead by example instead of preaching. I’d love to convince people around me that the only boundaries we encounter are the ones we set for ourselves. We are capable of achieving so much more in life that the sky is truly the limit. A few years ago, I would have been shocked if somebody had told me that I would become a vegan marathoner spreading the word of compassion all over the world. It’s time to stop being afraid, and start living life to the fullest.